Fake Food Props For Home Staging, Furniture and Retail Displays, Restaurants, Showroom Decorating, and More! Welcome to the Fake Foods Division of Props America. Over 90% of the faux food items carried by Props America are handcrafted and ship warehouse direct from our artificial food crafters. Please allow 1-2 weeks for delivery of some fake food items. If you need a rush delivery please call customer service (866) 909.6333 to check availability and shipping options. 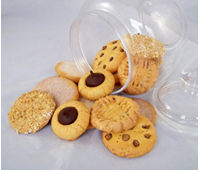 The artificial food props carried by Props America are made from various types of plastics, resins and materials to replicate the appearance of real foods. All materials are non-toxic and safe, but should not be eaten or used as toys for children. Faux foods make a great addition to decorate your home, stage a model home, accentuate displays in your store and for resale. Shop & Order by clicking on a category below. Did you know there are various names for fake food including: pretend food, wax food, artificial foods, faux food, replica food, imitation food, food replicas, false foods, food fakes, and simulated food. led to Japan to help with the rebuilding efforts. Foreign travelers had difficulties reading Japanese menus, so Japanese artisans and candle makers quickly developed plates of wax foods for restaurants that made it easy for foreigners to order something that looked good. Paraffin was used to create fake food until the mid-1980s; because its colors faded when exposed to heat or sunlight, manufacturers later switched to vinyl chloride. Fake foods are used in many ways, such as props for sets in movies, television shows, theatrical plays, television commercials, print ads and trade shows. Fake foods are also used to display lifelike replicas of real foods for restaurants, grocery chains, museums, banquet halls, casino buffets, cruise ships and in many other instances in which real foods can not be displayed. Fake foods, or faux foods, are used across several industries. Restaurants and markets use fake foods for displays of perishable goods that cannot be left out. Interior Designers, home stagers, and decorators use fake food props as finishing touches in numerous rooms in model homes and model apartments to create a warm and inviting home feel. Furniture manufacturers and furniture retailers use artificial foods on furniture pieces to show the capacity of dining sets, kitchen tables, and bars. Furniture retailers may use fake foods around the showroom to add color and warmth to the store for a more inviting shopping experience. Crafters and event planners often use artificial foods to construct centerpieces and props for special events. Numerous gift retailers resell fake food products for individuals to decorate their homes. Props America fake food props are perfect props for home staging and decorating model apartments. What are the Fake Food Props made of? Fake Cakes are made of a Styrofoam base and frosted with a rubberized material. The faux beverages are made of a poly resin that sets up to a hard plastic. Artificial cookies, fake donuts, and faux tarts are made of salt dough. All of the fake food sold through Props America is made of non-toxic materials and safe for display use. None of the food display items or fake foods sold on this website are edible and should not be used as toys for children. Who uses fake foods and beverage displays? Fake foods and faux food props are used across several industries. Restaurants and markets use fake foods for displays of perishable goods that cannot be left out. Interior Designers, home stagers, and decorators use fake food props as finishing touches in numerous rooms in model homes and model apartments to create a warm and inviting home feel. Our fake food props for home staging are a favorite for kitchens, bar areas and media rooms. Furniture manufacturers and furniture retailers use artificial foods on furniture pieces to show the capacity of dining sets, kitchen tables, and bars. Furniture retailers may use fake food props around the showroom to add color and warmth to the store for a more inviting shopping experience. Crafters and event planners often use artificial foods to construct centerpieces and props for special events. Numerous gift retailers resell fake food products for individuals to decorate their homes. How should artificial food props be stored and cared for? Always keep your fake food items dry and away for moisture and damp environments. Faux beverages may be dusted with a soft rag and furniture polish. Artificial cakes may be cleaned with a white damp rag. Do not allow your fake foods to become frozen or to be displayed in direct sunlight. What is the guarantee on the fake food props? All fake food prop items have a 30 day guarantee. If you are not satisfied with your purchase, you may return it within 30 days for a refund with a return authorization number. All returns must have a Return Authorization Number (RAN) and be returned in their original carton to receive a refund. Customer is responsible for return shipping costs. Returned product without a Return Authorization Number (RAN) will be REFUSED at the receiving dock. Over the years the products in the artificial food & fake foods industries have changed greatly, and they have been called numerous names that describe their purpose and function. If you are searching for artificial food props, fake foods, food replicas, food models, fake food for display, plastic food, pretend foods, and faux foods you have come to the right place.